TS101 (Titan Style) Style Stripes are printed on 2mm vinyl. 1. Die-cut 1-colour stripes cut-to-shape. 2 per helmet. Pack of 24 for 12 helmets. Approximately 1" Wide x 9" Long. 2. Two Piece, 1-colour imprinted stripes. 3. One Piece, 1-colour imprinted stripes. 4. One-Piece, 2-colour imprinted stripes. 20 mil vinyl pre-cut to 22" length. Mix and match widths and colours on your helmet to get the look you want. These stripes work best with helmets that have a raised center ridge. 25 stripes per pack of any one colour. Available in all colours in 1/2", 3/4", 1". Allow 10 business days for delivery. Custom Pro-Tuff Helmet Award Decals/Stickers. 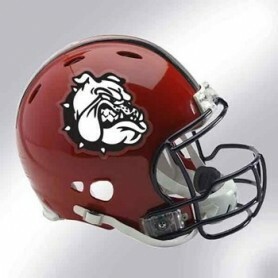 Helmet decals are printed on a 2mm vinyl and die-cut to shape. Available in Skull or stars. 25 decals per sheet. Others sizes and custom range available, call on freephone 0800 917 4245 to discuss your options. 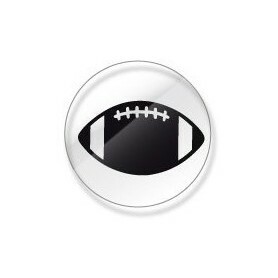 3cm x 3cm Helmet Decal - "Lifting the Lid" Mental Health Awareness Campaign for Badass Ballers! This is a particularly important campaign as the American Football community has seen an array of our members, both in the UK and globally, struggle with these issues, with some resulting in absolutely devastating circumstances. The aim of Lifting the Lid is to encourage the American Football Community to help change the stigma associated with mental health. 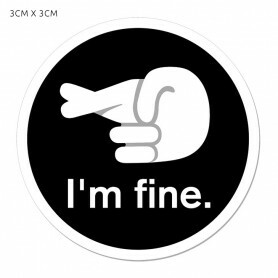 With the football community wearing the "I'm fine" decal we can show our solidarity with those suffering with mental health issues and encourage them to "Lift The Lid", talk freely and confidently, and ask friends, family and teamates for help. With your support we can ensure people get the right services and support to help their recovery or to enable them to live more comfortably with their mental health problem, whatever it may be. Tapered Stripes are printed on a 20 mil vinyl that applies as a single decal for perfect alignment. 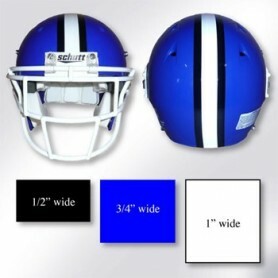 Hot tapered stripe style for ANY helmet! Available in all colours and patterns. Easily aligned and applied. Made with our tuff 20 mil vinyl, Approx. 11" long. In solid colours, or choose our custom imprint patterns! We are continuously creating new patterns and styles...or we can create something for you...FREE! Almost any decal can be imprinted with these and other unique patterns for an incredible look! Choose a stock pattern shown here (in your choice of colours) or we can create a custom pattern. More stock patterns are in the works!